'Giant Spider & Me: A Post-Apocalyptic Tale Vol. 1' review: A flawless and unique debut volume – AiPT! A heartwarming story about the friendship between a little girl and her gigantic mutant spider. As a comic book reader in the age of solicitations, I usually know what I’m going to purchase each week before stepping foot in my LCS. Even when I make an impulse buy, it’s usually on something I recall seeing advertised online. Every now and then, though, I spot a promising cover on a series I’ve never heard of, and I get to take a shot in the dark. There’s just something special about finding a book by complete chance and falling in love with it. That’s the type of experience I was hoping for when I bought Seven Seas Entertainment’s Giant Spider & Me: A Post-Apocalyptic Tale Vol. 1. Written and drawn by Kikori Morino, the manga’s first installment collects its first four chapters and introduces a premise the likes of which I’ve never seen. Does it do so effectively? Is it good? There’s a lot to be said for good pacing. Plot events and world-building can either excite or crash and burn depending on when and how they’re incorporated. Giant Spider & Me Vol. 1 is one of those rare books where absolutely nothing feels too rushed or too slow. The opening chapter introduces us to Nagi, a twelve-year-old girl who lives alone in a post-apocalyptic world, and Asa, a gigantic wild animal who resembles a spider and who has foliage growing out of their back. While Morino provides hints throughout, she never explicitly reveals Asa’s origin, the location of Nagi’s missing father, or what happened to this rundown world. We as readers are left with a mystery that only gets more engaging as the book goes on. In later chapters, Nagi invites Asa to come live with her and then attempts to establish means of communication between them. The speed with which the two characters become acquainted and build trust feels very believable. Morino depicts many sweet interactions between Nagi and Asa, but never loses track of the fact that they belong to different species, and thus will never be able to fully understand everything the other does or feels. This sense of (relative) realism adds a sense of credibility to their relationship that helps make it all the more heartwarming. Another way this volume builds up the pair’s relationship is with cooking scenes. Nagi cooks a variety of foods and beverages for Asa, and each time she does we get a full step-by-step guide to making the dish, complete with a list of ingredients and the most beautifully drawn food you’ll find in any manga short of Food Wars!. These moments of domesticity highlight how Asa and Nagi interact on a daily basis, and there are adorable occasions where Asa helps cook as well. 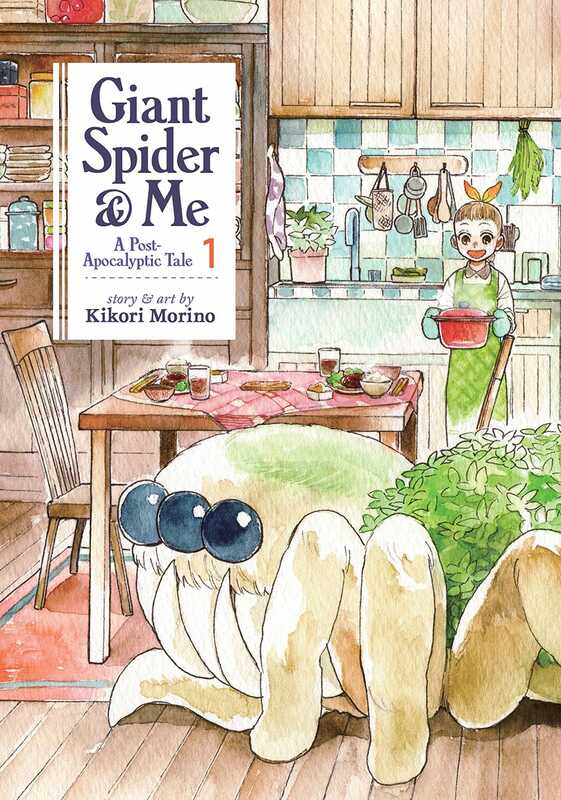 It might sound implausible for a post-apocalyptic manga to successfully incorporate recipes into every chapter, but Giant Spider & Me does so with charm. Ultimately, the cooking scenes feel right at home next to the rest of the series’ unique touches. The amount of detail that Morino can pack onto a page without making it feel too busy is amazing. It’s not just the writing that impresses in this volume. Morino’s artwork is stunning from start to finish. The first four pages feature stunning watercolor renderings of nature, while the rest of the volume is drawn in more genre-typical pen and ink. Morino doesn’t let up after changing mediums; her renderings of light, shadow and foliage are consistently beautiful and impressively detailed. Also noteworthy is how fantastic Asa’s design is. I, like many people, am scared of spiders in real life, but Asa has the cutest design of any new character I’ve seen this year. The vegetation coming out of Asa’s back is an especially strong design choice, as it makes the character less scary while also alluding to a potentially fantastical origin. With that said, Morino also plays up the horror angle of having a giant spider as a character. There are multiple shots of Asa opening their mouth to eat, revealing an additional set of fangs within their pitch-black maw. Moments like these live up to the expectations set by the series’ title, but are still played comically enough to match the actual lighthearted tone. Overall, Giant Spider & Me: A Post-Apocalyptic Tale Vol. 1 is among the best, most unique comics I’ve ever read. The premise is fantastic, and Morino provides satisfying hints about the manga’s world without ever resorting to exposition dumps. The artwork is beautiful throughout, the cooking scenes add yet another unique flourish, and the pacing is impeccable. As if that all weren’t enough, the cliffhanger at the very end couldn’t possibly be more well-executed. I only have to wait two months before this series’ next installment comes out, but with a story this good, even that feels far too long. From the art to the pacing to the cooking segments, each part of this volume meshes perfectly with the others to form a delightfully weird and charming whole.